Last week I visited Visingsö, an island in Lake Vättern; it is an island with plenty of ancient remains and cultural heritage. If you happen to be in the vicinity it’s well worth a visit. I’ve written about Visingsö here before so I thought I should show a few things that are easy to miss out on. Just south of Kumlaby church is Visingsö folk high school and Visingsö Museum. The museum is situated in a building from 1633 built as a courthouse by count Per Brahe the younger (1602-1680). In 1680 it had lost its use as a courthouse and became the “new” school house for or the school Per Brahe established on Visingsö in 1636, it had previously been housed in Kumblaby church. In 1816 the school was moved to Jonkoping and is today known as Per Brahe high school. Today it houses a small museum. The collection isn’t big but relevant and hold finds and keys to the islands history, from the Stone Age and fourth. 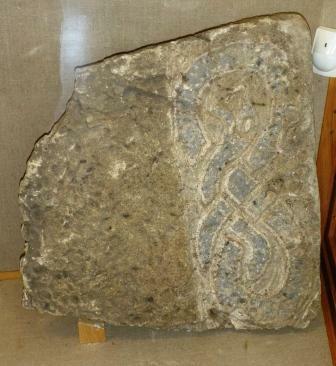 Within the museum two of four known rune stones from Visingsö are walled in (one is long since lost and the fourth at Jonkoping County Museum). It’s well worth a stop while you’re on the island. A few pictures from the museum. 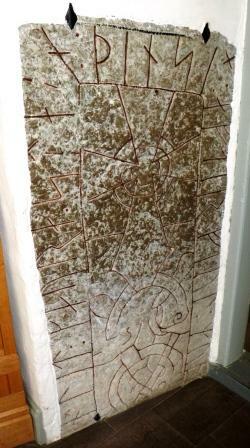 Translated to English: Áskell and Gunna laid the stone … their husbandman. May God help his soul. 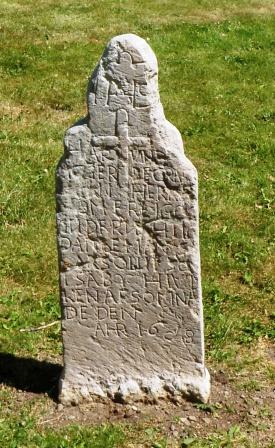 Translated to English: … had this stone made in memory of Fjôlmóðr ..
At the graveyard by the Brahe church, aka Ströja church (Per Brahe the Younger demolished most of the medieval Ströja church in the 1600s and built the Brahe church, the only remaining part of the medieval church is the tower), this piece of a stone cist, of Eskilstuna type, with ornamentations was found in 1988. 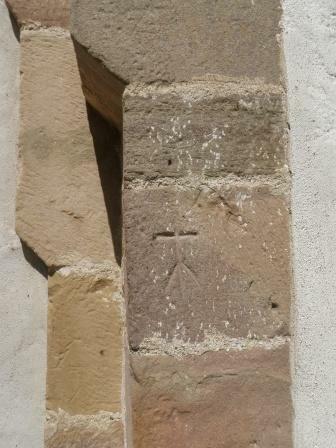 These kinds of stone cists, or remain of them, are unusual and found around some medieval churches. 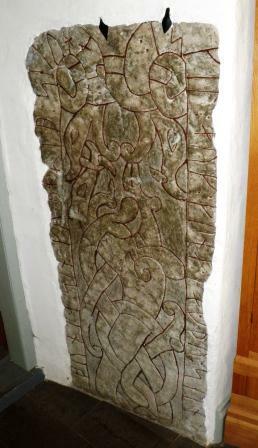 These monuments are normally dated to the 11th or 12th century and may indicate an older church than the Ströja at the spot. 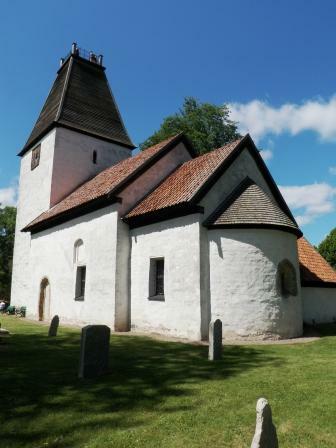 Ströja church was built during the 12th century. On this some the colours are intact. 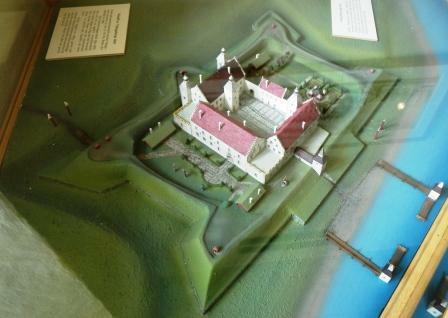 A model of Visingsborg castle, as it once looked. Today the ruin can be seen from the harbour, and is open for visits. As you will notice, if you visit only ruins, there are only ruins of the southern part of the castle, the west wing and the north wing have long since gone – but the ruin is impressive none the less. The original school house was Kumlaby church. 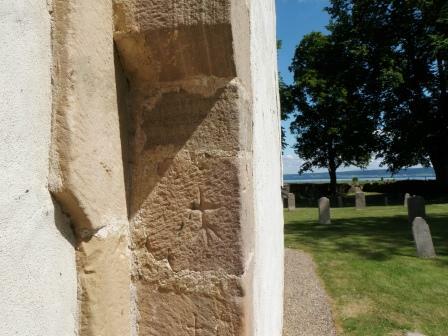 The church itself was probably built during the 12th century and is open for visitors during the summer for a small fee, you’re also allowed up in the tower to watch the view. Until 1811 the school used the church building at least occasionally but after 1811 it became a deserted church left to the forces of nature. During its use as a school the building went through some rather big changes: The entrances on the south side of the tower and the nave was walled up and a portal to the west was raised, the medieval windows of the naves north and south walls were also walled up and square windows were raised. 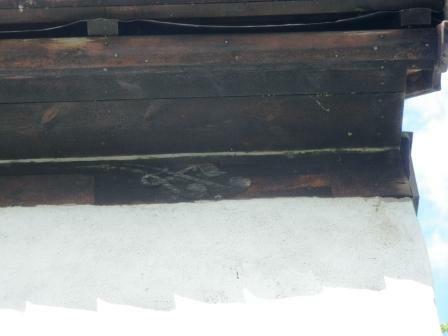 The paintings on the inner walls and roof were covered by lime. The spire was removed and a patio made for astronomical observations. Though used as a school the burial ground was still in use until 1893, though not frequently, when a new burial ground was landscaped at Brahe church, by the harbour, on the island. From1876-1884 the decay was temporary stopped as the church was being used as a missionary. Between 1884-1922 it was once again left to the forces of nature. In 1922 a renovation was started, in the church the paintings from the 15th century was uncovered, some of the 17th century paintings have been kept. 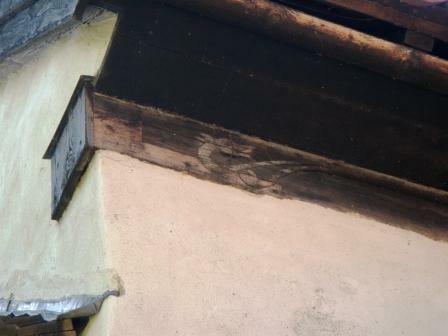 The work restoration is described in J.M. Danielssons book Kunlaby kyrka och kyrkogård på Visingsö 1929. (Kumlaby church and graveyard at Visingsö). The paintings within the church and the hike up the tower are interesting but I believe there at least as interesting things that can be seen outside the church. Just under the roof of the north and south side of the nave, in the east end, one can see carved ornaments in the form of leaves and animal ornamentation. 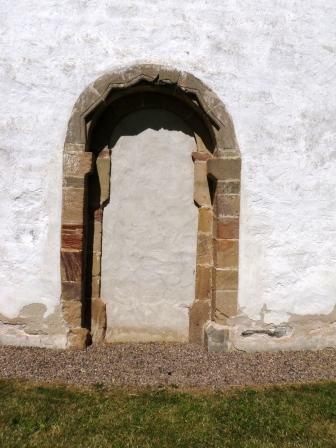 Another interesting detail is at the southern portal, made of sandstone, which has a zigzag ornamentation which indicates a probable influence from the west, from England. Furthermore, there are two clear stonemason brands in the portal. Walking around the churchyard I’m also struck by how well-preserved the gravestones are. These are just a few of the things there are to keep an eye out for; I’ll probably come back to Visingsö again.